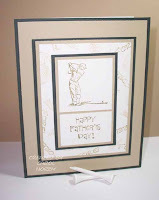 Do you have your Father's Day cards done? I do finally have mine and they will go in the mail tomorrow to my Dad, Son, and Stepson. My son used to golf as a kid and is really into 4 wheel drive pickups, etc. but he will get one of these cards. All 3 use the FORE! set. This first one is a shadow box card. You cut 2 pieces of cardstock to 4 1/4" x 5 1/2" and score both at 1/2" and 1" on both ends on both pieces. I used my Coluzzle Small Nested Circle, Swivel Knife, and Mat. I found the center of my top piece and lined up the tabs from the circles and chose which size circle I wanted then cut. Remember to place your cardstock on top of the mat or you can damage your knife and not get a good cut. I lined the inside of the back piece with a piece of white cardstock and stamped the scene and colored with my Prismacolor Pencils. 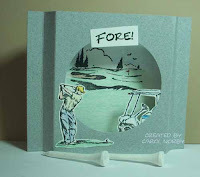 I stamped the golfer and golf cart on scrap pieces of white cardstock, colored, and cut. You can see I placed the golf cart on the inside of the top to add more dimension, and you might use a pop dot to adhere it for even more dimention! Pretty cool card! This 2nd idea was kinda stamplifted as I seen it on Paper Wings and liked it very much. The original had a beautiful brown ribbon and different text. I used shades of green, beige, and white cardstocks and the card is 5 1/2" x 7". I stamped the bottom white layer with the golf ball and FORE! with coordinating Versamagic Inks. The text is from Trendy Greetings but you can use any saying appropriate to the occasion of giving! This last card is also 5 1/2" x 7". I used white and scrap blue cardstocks. 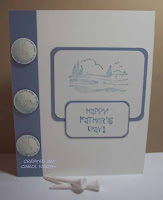 I stamped the ball on white with a coordinating blue ink and punched out using my 1" circle punch. I used Pop Dots to raise the off the side and covered with Crystal Lacquer. Love the effect. I stamped the scene and text in the same blue. I really should have cut my blue layer a bit bigger for the text. I used my corner rounder on all four layers. Again, you can use any text appropriate for the occasion. Well, I need to start getting some house cleaning done. Happy stamping! Carol - I Love all your cards - am hoping to get some done on Wednesday as have my last hostess club tonight (Tuesday) until Sept. I really like the clean looks that you use! I love the shadow box card!! I am definitely going to do one of those soon!! What awesome cards with this set! Love all of these! The first one is soooo cool! love your golfing cards. I am sure they will be appreciated!